Easy to prepare luxury salad. Toss the pear slices with half the lemon juice. Arrange the salad on four serving plates. On top, scatter the pear slices, slices of ham and the Roquefort. Whisk together the remaining lemon juice, olive oil, yogurt and seasoning. Drizzle over the salad and scatter with the pomegranate seeds. Serve. 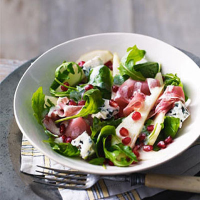 You can always use Stilton cheese instead of Roquefort and swap Serrano ham for Waitrose Parma Ham. The flavours in this salad are perfect with the delicious and aptly named Château Roquefort Roquefortissime,Bordeaux, France,with its pear, lemon and lime flavours and lovely soft texture. This recipe was first published in November 2010.